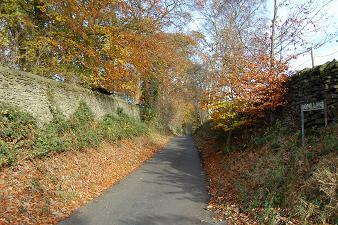 A narrow country lane running from Bollington at the top of Beeston Brow, at the junction with Green Lane, along the hillside to the top of Shrigley Hill. A very few houses and farms are spread along the lane which provides outstanding views across the Cheshire plain to the west. It is a very popular walking route. Approach off Shrigley Road South, Pott Shrigley. No entry for large vehicles! No exit the other end! Long Lane is very narrow and has no turning places for commercial vehicles. 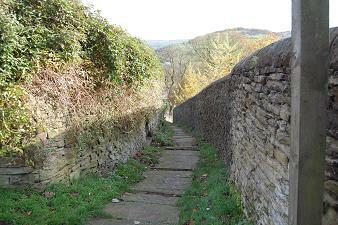 The Beeston Brow end is very narrow and very steep with a very sharp corner. 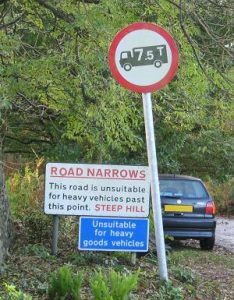 It is physically impossible for any vehicle over 7.5T to negotiate the full length. It is also illegal for such vehicles to enter the lane. See details of an October 2008 casualty. Access is available for the first 100m at the Shrigley Road end for entry to the industrial estate. Leads to Beeston Brow, Green Lane. Pedestrian access to Beeston Mount. Nearest pubs – Holly Bush. 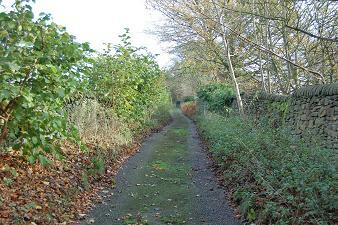 Green Lane is a narrow lane to Green Lane Farm being a public right of way on foot. It runs along the top of the cliff face at the back of Beeston quarry. Over the wall is about a 90ft drop. 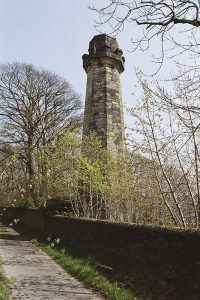 However, there is a small plot of land on which is built an octagonal stone chimney complete with castellations around the top. This was an early chimney for Oak Bank mill. The boilers were connected to the chimney via a tunnel up the hillside. This can still be seen in winter (no leaves) from Hamson Drive. Siting the chimney high up on the hill top gave an effective height of near 200ft. 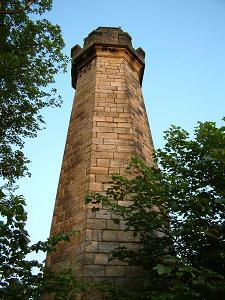 This chimney was replaced by a new brick chimney next to the boiler house in about 1912. That one was demolished to make way for Hamson Drive. 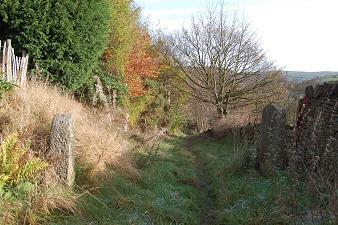 There are two footpaths from the top end of Green Lane down to Beeston Mount. The left hand route is a gentle slope around a dog leg. The right hand path takes a more direct route but is stepped most of the way. Care required when wet!! A handrail has been fitted to the steepest part since this picture was taken.